Ambitious mistress & 2nd wife of Nero, who stomped her to death. Prompted him to kill his mother [Agrippina] & teacher [Seneca]. Former wife of Otho, who briefly became emperor after Nero's death. 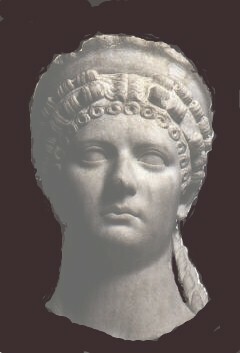 Mother of Nero's only child, Claudia Augusta, who died as infant. Poppaea Sabina - article in Wikipedia's web. Poppea's Villa - Peter Bardwell's exquisite photo tour of frescos at Oplontis on the outskirts of Pompeii.